The convoy entered Gaza from Egypt via the Rafah Border in early July. Most members stayed for our two week programme; others stayed longer and completed independent projects. 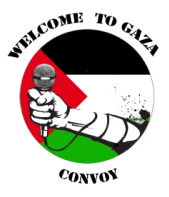 Convoy members comprised of journalists (citizen, independent and commercial), photographers, filmmakers, media students, activists and mental health professionals — from diverse backgrounds, all of them are people of conscience, deeply passionate about the Palestinian cause. One of the main goals of the convoy is to produce English-language media content to help amplify the Palestinan narrative to audiences in the most complicit Israel-supporting Western states from where most of the convoy members originate. The convoy organising team comprises of Palestinan and international volunteers living in Gaza. A programme of transport, accommodation, and work is arranged for convoy members. Convoy members have backgrounds in the media, campaigning and mental health. Those with media skills will include journalists, bloggers, photographers, and filmmakers. Others will come with social media and traditional campaigning skills. Mental health workers will also bring their experience and expertise.